Water storage needs to be protected against viruses, contamination, and bacteria. So you must take different measures to protect your water from these threats than you would with food. Here are 5 common myths and facts about water storage that you’ll want to consider as you start your water storage reserves. Myth #1: Water can expire. Fact: Water does not expire. It can become contaminated (chemically or biologically), but it doesn’t “go bad.” Water can have a stale taste, but that taste can be eliminated by rotating your water and purifying it. If a water storage source is in ideal conditions (it started out clean and was stored in a dark, cool area, not directly on concrete or near harsh fumes and chemicals), it technically can store indefinitely. Rotate water for peace of mind or if there is a risk of contamination. Myth #2: It’s fine to store water in any type of plastic container I have at home. Fact: Water should be stored in a UV-resistant, food-grade plastic container or in metallized bags. 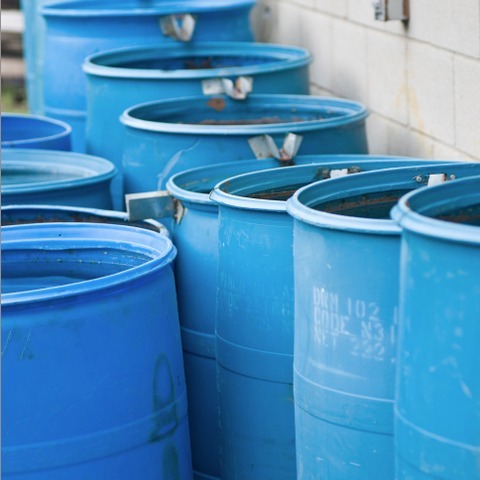 Traditionally, water storage barrels are blue. This color limits light exposure and biological growth (bacteria and algae) and also signifies that what is stored in the container is safe for human consumption (for example, gasoline is stored in red containers). The safest containers to hold water in are polyethylene-based plastics, or plastics #1, #2, and #4. Our water barrels are made out of plastic #2 and, unlike some other companies, have never been used to store other items before they are sold to you. This type of plastic is good for long-term storage and is BPA-free. •	Don’t use milk jugs for water storage. Since milk jugs are biodegradable, they will break down over time. Also, any live cultures in the milk that remain in your jug could make you ill if you store drinking/cooking water in milk jugs. •	Disposable water bottles are not great for long-term storage. Water can be stored for long-term use in re-useable Nalgene bottles. •	Soda Bottles and Powerade/Gatorade bottles can be used for long-term water storage. However, it’s important to remember that plastics absorb flavors, so your drinking water may have a cola taste. If you store water in soda or Powerade bottles, don’t use the water for cooking or else your soup might taste like cola! Myth #3: If I have a water barrel I’m set for every emergency I’ll encounter. Fact: You can’t solely rely on the barrel for all the situations you may encounter. If you have to evacuate, you won’t be able to carry a water barrel with you. Also, if you only have one barrel or one water source you may run out of water given the number of people in your family and the number of days that you will be without water. Remember that the average amount of water to store is one gallon per day per person for a 2 week period. Store water in various sized containers and plan for different situations (grab-and-go, shelter-in-place, extra water for cooking, etc.). You can siphon the water from your barrel into other containers and refill it before emergencies arise. Myth #4: To save space, I can stack water barrels on top of each other. Fact: Most water barrels are not built to stack on each other. If you want to stack your water because you don’t have room, use water containers with grooves on the bottom for stacking, like our 160 Gallon Water Reserve, Aqua Pak or Aqua Tainer. Water barrels are safest if they are stored standing. However, do not store your barrel directly on cement or on the floor in your garage. Plastics absorb flavors and odors from gasoline, liquids spilt on the floor, and chemicals used to create the concrete. These chemicals and odors will make the taste of the water unbearable to drink. Instead, place your water barrel on top of a wood board or cardboard so that odors and chemicals do not leach in. Myth #5: If I have a water purifier, I don’t need a filter. Fact: Water purifiers like Chlorine Dioxide will kill 99.9% of all microorganisms (like protozoa, bacteria, and viruses) in your water. Chlorine Dioxide is excellent for sheltering-in-place, and also great for treating water from your barrels or water you collect from streams or rivers while hiking. If you’re a first time barrel buyer, remember that you’ll want to buy a water storage combo. Each combo includes a bung wrench, replacement bung (a bung is the white cap on top of your water barrel), siphon hose, and water purifiers for maintenance. "Not all Barrels are Built the Same"